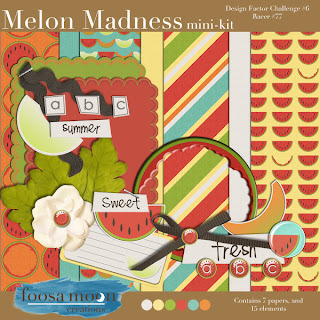 Foosa Moon Creations: Melon Madness! The final week of the Design Factor challenge is here. I spent this week knee deep in melons. I even found myself dreaming of ways to use melons in the kit! Those melon scalloped mats...one of my midnight ideas. I've really got to switch my creative clock around! I'll sleep a whole lot better if my ideas come in the morning than while I'm trying to fall asleep! I'm kind of sad to see the end of the Design Factor...but excited to share that I will be taking part in ANOTHER challenge series, Designer Apprentice, at digiscrapaddicts.com. So there will be 5 more weeks of free kits to share with you! I find I am learning so much through each of these challenges, and stretching my creativity at the same time. Thanks for the free kit. I love that melon frame–so creative! Thank you so much for this post. I want to let you know that I posted a link to your blog in CBH Digital Scrapbooking Freebies, under the Page 3 post on Aug. 08, 2011. Thanks again. Such a cute kit - thank you for sharing!